The Florida Department of Transportation (FDOT) will be reducing Bee Ridge Road from six to four lanes as it works to improve drainage in a four-mile project from Siesta Drive east to Dunn Drive, an FDOT spokesman informed the Sarasota County Commission and county staff this week. Robin Stublen provided the details in a Jan. 19 email that The Sarasota News Leader obtained. The $17 million construction contract calls for the work to take about two years, he continued. The contract includes an incentive of $10,000 per day, up to 75 days, if the project is completed ahead of schedule, he added. A disincentive of $10,000 per day also is part of the contract, he added. The work entails removing old asphalt and resurfacing the roadway, reconstructing sidewalks and installing new signalization in some areas, as well as improving drainage. The project also includes construction of 11 pedestrian refuge islands on Bee Ridge Road between U.S. 41 and Dunn Drive, Stublen pointed out. 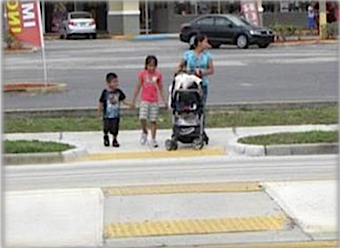 Those islands “provide a safe space for pedestrians to stop before crossing the remaining portion of the roadway while increasing the visibility of pedestrians to motorists,” says a flyer FDOT prepared about the plans. Additionally, he pointed out, as FDOT design engineers performed site visits, “they noticed major cracking of sidewalks and driveways. Closer video inspections, he continued, revealed shifting of the drainage pipes, creating depressions. two design engineers walked the project limits, handing out flyers and discussing the plans with representatives of local businesses. I simply don’t understand why construction had to begin during “season”! I hope that construction will conclude ahead of schedule.